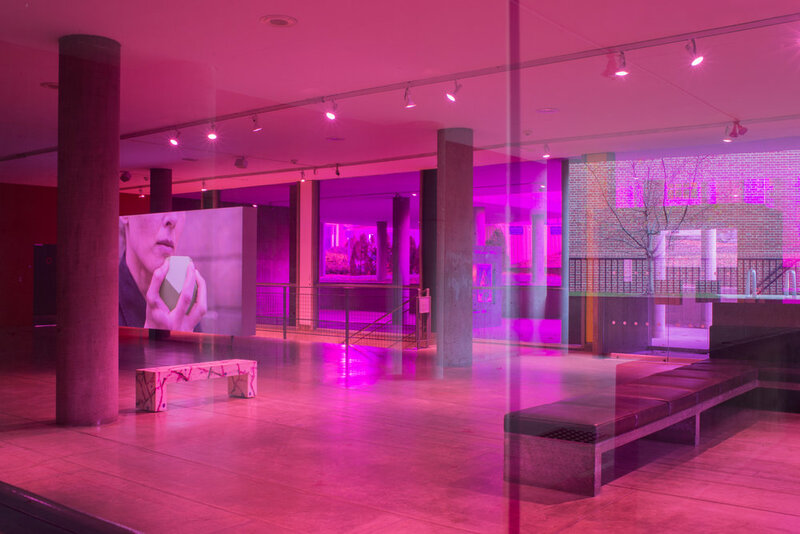 Shahryar Nashat: Skins and Stand-ins features a combination of video, sculpture, architectural interventions, and commissions, forging a cohesive environment where the sensibilities and physicality of spectators become formally implicated in Nashat’s inquiries. Shahryar Nashat uses photography, sculpture, performance, and video to disrupt and reframe acts of looking in order to bring the uninvited or disregarded into the forefront. He works with figurative and abstract sculpture to push against frequently circulated–and often idealized–canonical representations in visual and intellectual culture. His impulse is to direct our gaze toward the appearance of objects and movement of human bodies that art history, modern dance, sports, Minimalism, fashion, and advertising have ignored or pushed aside. Nashat thus draws attention to and prioritizes the vulnerable and the fragile–the seemingly imperfect. And as part of this process of reframing the way we see things, he emphasizes the permeability of human skin and its susceptibility to scratches, punctures, and tears. In doing so, he fixates on both the concept and construction of the prosthesis. This extension and support for the body is laden with great potential for release from a deeply engrained understanding, and thus expectations, of how a body should look, move and perform, something other than notions of perfection–something that is independent and autonomous from canonical orders. Installed on Level 1 of Le Corbusier’s 1963 Carpenter Center and intervening in the Busch-Reisinger Museum’s room 1510 on the first floor of the Harvard Art Museums, the exhibition Shahryar Nashat: Skins and Stand-ins features a combination of video, sculpture, architectural interventions, and commissions that create a cohesive environment where the sensibilities and physicality of spectators become formally implicated in the artist’s inquiries. To visit Harvard Art Museums, please find the gallery hours and information here. The work of Swiss artist Shahryar Nashat (b. 1975) has been included in the Venice Biennale (2005, 2011) and the 8th Berlin Biennale (2014). He has exhibited his work in venues such as Palais de Tokyo, Paris; Kunsthaus Zurich; Haus der Kunst, Munich; Tate Modern, London; Hammer Museum, Los Angeles; Art Unlimited, Basel and Frieze Projects, London. Upcoming exhibitions include Portikus, Frankfurt (2016, solo); Schinkel Pavilion, Berlin (2016, solo) and Walker Art Center, Minneapolis, Minneapolis (2016, group).